30-year-old, Kingston-born Jackson is keen to kick-on during his second season at the club and is targeting more goals following a positive summer break. 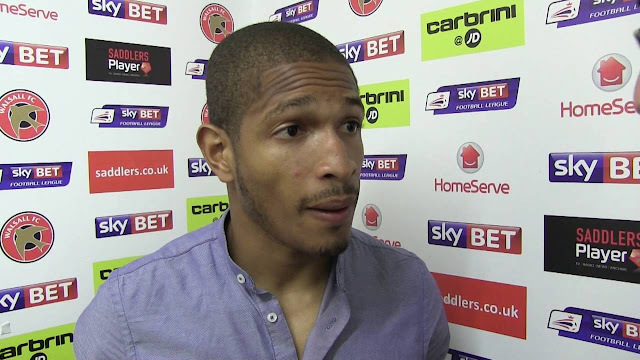 Walsall striker Simeon Jackson, who scored just seven goals during his debut season at Banks's Stadium, has spoken to Walsall reporter Joseph Masi and discussed how much work he has put in over the summer, his desire to get back among the goals and what he will take from the squad's recent visit to Cassius Camps. 30-year-old Jackson, who was speaking via the Express & Star, revealed that he sought the help of a personal trainer before returning to pre-season training, as he wants to start the upcoming campaign on the front-foot. Jackson, who joined the Saddlers from Blackburn Rovers last summer, said; "I hired a trainer and did a lot of work on my own to make sure I’m in the best possible shape for the season. It was more about a mindset shift really. A few things have been highlighted to me that I need to change. "It’s just a case of going out and getting those goals now. I need to flick that switch and get scoring regularly. It’s important for a striker to get goals. Goals are what I’m about. There are a lot of strikers getting really good figures and there is no reason why I can’t be the same." Simeon also discussed the recent visit to Cassius Camps, and, as with all of his teammates, has hailed the boot camp as a life-changing event that he is determined to kick-on from, he continued; "It was a great trip and it was amazing what we achieved. There were some big things for me, the swimming and abseiling down a cliff. The camp really focused on the individual battles you have as well as working with your team mates. "I learnt so much and I’ve now got my goal target for the season and I am committed to getting there. I’m going to do my absolute best to get there. I’m really looking forward to getting started."